Faced with an aging community and diminishing numbers, the Dominican Sisters of Houston, founded a new model for the Dominican Charism. Not wanting to lose their 125 year presence in the greater Houston area by merging with other orders, like many of their contemporary communities had done, they founded the Dominican Family...a group of women and men not bounded by faith tradition, but by the simple desire to live the Dominican ideals of prayer, study, community and preaching. Initially, the Dominican Sisters of Houston invited friends and acquaintances to explore this new concept. In the Fall of 2008, the first gathering of the Dominican Family took place. Additionally, a small group of Dominican Family members met regularly to better formalize this emerging entity. In 2009, members crafted a Mission Statement and formalized the Dominican Family Identity around the pillars of Prayer, Study, Community and Preaching. A two-year formation process was established, with the Dominican identity being formalized and celebrated at a Commitment ceremony. In the early formation years, the Dominican Family was totally supported by the Dominican Sisters. However with increased knowledge and experience, the Dominican Family wanted to take more responsibility for themselves. 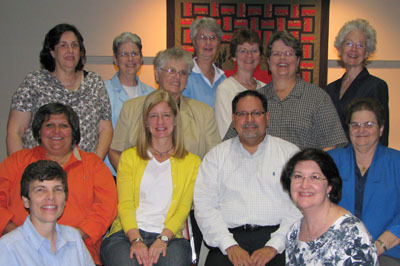 In the summer of 2011, a large group of Dominican Family members interested in leadership, gathered and brain-stormed about their vision of Dominican Family leadership and focus. From this gathering, a Leadership model was proposed and approved. In 2012 the first Dominican Family Leadership Team was elected, along with the establishment of key committees and Committee Chairs to better meet the needs of a rapidly growing membership. Now, the Dominican Family views its relationship with the Dominican Sisters of Houston as “walking side-by-side”. Since 2008, the Dominican Family, has grown not only in membership (over 150 Committed Family members), but also in its' response to critical concerns in the Houston area, like Poverty, Human Trafficking, and Care of Creation. Sharing in an 800-year history of Dominican women and men, we too are called "to begin".